An Overview of Gold Mining in Arizona. Arizona is one of the most popular state in the US for gold prospecting. The gold deposits are also very widespread. With the exception of a few counties, generally there are good amounts of gold throughout the entire state. 3. There is a lot of gold there to find! Below is a County-by-County Overview of the Gold Mining in Arizona. This county has some beautiful geology, but gold deposits are very limited. From the 1800s up through 1959, there was 2,723,000 ounces of gold recovered in Cochise County. The vast majority can be attributed to Bisbee and the surrounding mines. The gold found here was primarily derived from the copper ores. Placer deposits have been found on a smaller scale from various other areas including the Tombstone Hills, Dos Cabezas mountains, Huachuca mountains, and various gulches around Bisbee. Fine gold particles occur in the clays throughout this county, but quantities are very limited and this county is generally considered fairly poor for prospecting. An estimate of 240,000 troy ounces of gold has been attributed to this county, nearly all from copper lodes mined in the Globe and Miami area. Only limited placer gold occurrences have been found here. 228,000 ounces of gold have been found in Greenlee County, almost all of which have been mined as a by-product of the copper mines. Overall the production has been very low in Graham County. 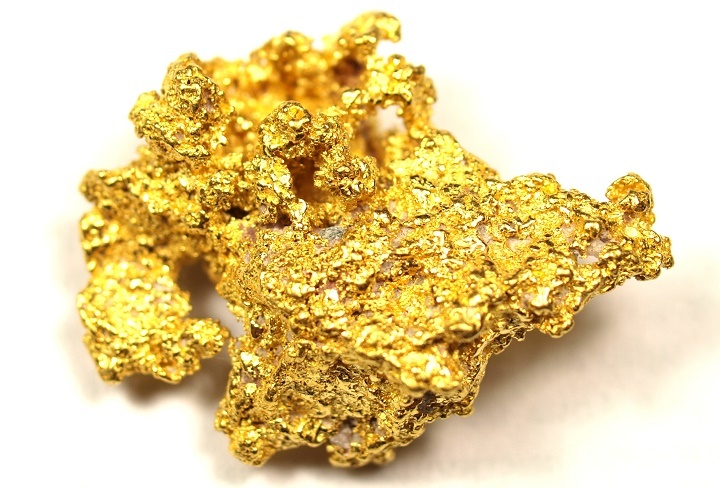 The best gold is found as very fine gold in the Gila River. There are a few scattered mining districts where gold ores have been mined but overall production has been very low. This is one of the better counties for gold mining in Arizona. There have been 428,000 ounces of gold mined here, the vast majority of which comes from the Vulture Mine near Wickenburg. Maricopa County is also popular for prospecting because much of the gold here is found in sizable pieces that can be found with metal detectors and drywashers. 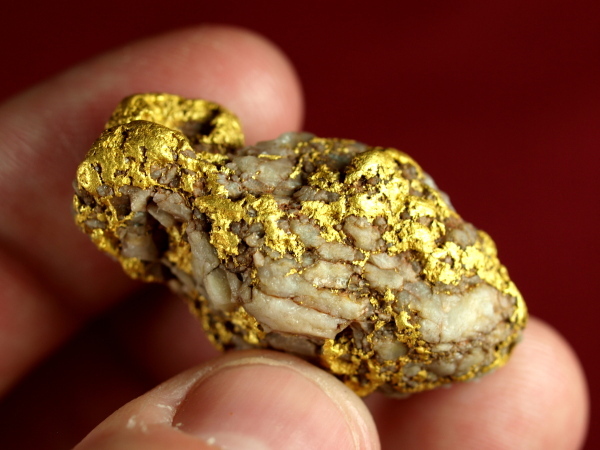 Some of Arizona’s largest gold nuggets have come from this part of the state. Of particular interest are the San Domingo wash and the Hassayampa River. This is the 2nd largest gold producing county in Arizona, with 2,461,000 of total production. Most of this has come from the various lode mines in the Black Mountains and from the mining town of Oatman. Gold Basin is another good area for gold prospecting. Gold is scattered over a very large area. Drywashing is productive if you can locate a rich place to dig. This is a very popular area for gold mining in Arizona. 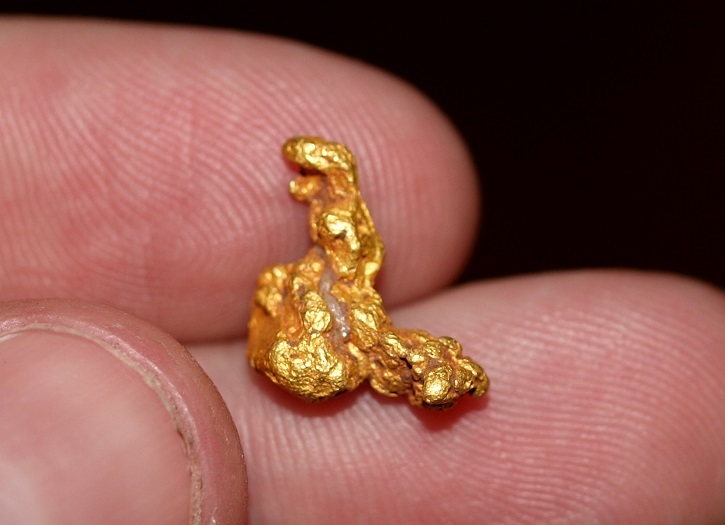 If you want to find gold nuggets like this, a metal detector is a must! There are very limited gold occurrences in Navajo County. 1,081,000 ounces of gold have come from Pima County, mostly from the Ajo district where large lode mines produced gold. For the average prospector, the best area to search is Greaterville. This is primarily a placer mining district and some nice gold nuggets and crystalline gold specimens have been found here. There are several areas in the Santa Rita Mountains near Greaterville where scattered gold deposits can be found. A reported 893,000 ounces of gold have been mined in Pinal County. The Mammoth Mine in the Black Hills along with several copper mines south of Miami is credited for most of this gold production. The Oro Blanco mining district near Ruby is credited for most of the gold found in Santa Cruz County. There have been about 108,000 ounces recovered mostly from scattered placer deposits. This county ranks first in overall gold production for Arizona, yielding an estimated 3,500,000 ounces of lode gold and 300,000 ounces of placer gold. There are countless areas in Yavapai County that are worth exploring for gold mining in Arizona. A few worth noting are at Hassayampa River and the many tributaries that feed into it. Lynx Creek is another very rich and popular area which also has a special area set aside for gold prospecting. Rich Hill is yet another place with a very rich history and some of the biggest gold nuggets ever found in Arizona. Other areas of note include the Bradshaw Mountains, Bagdad, and anywhere around Prescott or Yarnell. Nice specimen! Gold is often found mixed with quartz. In the old days the miners would simply crush them up and remove the quartz from the nugget, but now collectors will pay a nice premium for beautiful rare specimens like this. Gold deposits are widely scattered throughout Yuma County, with roughly 771,000 ounces of total production. Some special areas of note include the Dome district in the Gila Mountains and the La Paz district about 10 miles west of Quartzsite. This area is very popular for metal detecting during the winter. It should be noted that the estimates of gold production mentioned here are all estimates that are all most likely considerably lower than the actual amount of gold that has been found. The reason for this is quite simple really… the old-timers never bothered to report the amount of gold that they found. Only the major mines recorded their gold production, but the average prospector mining for gold in Arizona would likely never report their findings. Arizona has some of the most widespread gold deposits of any state in the US. Although it only ranks as 10th overall in production, it is still one of the best places for small-scale gold prospecting due to the amount of open and available land for prospecting as well as the number of scattered deposits that are still out there to find. There is still a lot of gold to find in Arizona. Focus your efforts on the areas that have produced gold in the past, but don’t be afraid to venture out and explore new areas as well.